Grandma Dora became a typical, poor dairy farmer’s wife when she married in the 1930s. She loved her family and was dedicated to them. She worked from dawn till dusk in the house, but especially enjoyed her time in the kitchen, making homemade meals from scratch for her husband (our grandpa) and her two boys, Bobby (our dad) and Billy. She used recipes that were passed down from her mother and mother-in-law, neighbors and church friends. She strove to please everyone by making their favorites when they came to visit. She showed her love through her cooking and she treasured watching her family enjoy what she had made. As we’ve grown up, we’ve heard stories of Grandma’s cooking and baking. About the hand churned butter that dripped off of the homemade bread of a BLT. Or the cinnamon rolls that rose for hours before they were baked, frosted and devoured. Hearing our parents’ speak of the Sunday pot roast dinners after church, with mounds of mashed potatoes and cooked carrots that were always cut round like a dime. You could almost taste it as you imagined what it would have been like to have been a part of those special family meals. 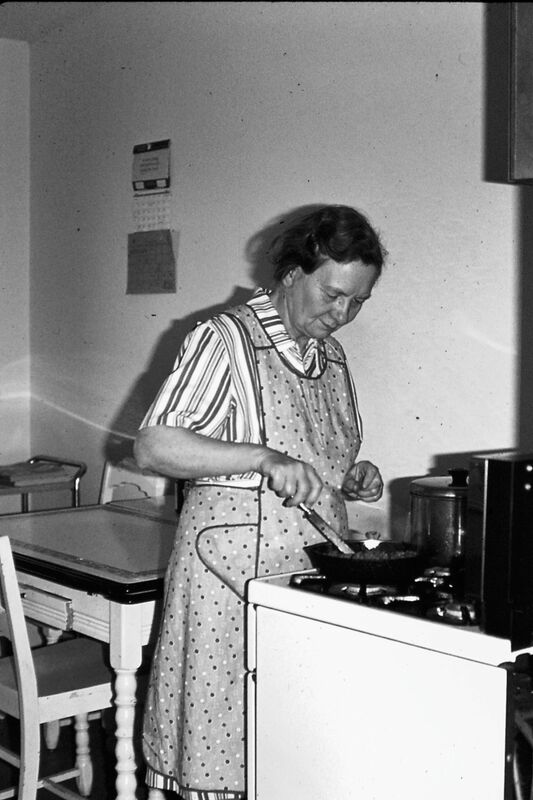 Grandma Dora died before we were old enough to be in the kitchen with her and glean from her natural skills. As mere toddlers, our own memories of her are few. Opening Grandma’s recipe box is like opening a box of memories. We’ve chosen to share them with you one at a time. In hopes that you too will enjoy some “new,” from scratch, farm cooking and baking that will bring your family as much joy as it brought our Grandma when she made and served it to hers. We will try to post new recipes every little bit, so please stop back often to see “what’s cooking.” We’ll have plenty of recipes from Grandma Dora and some of our own to share as well. We hope you enjoy reading about these recipes and if you try one for yourself, please let us know what you think! I love this idea. What a neat way to honor your grandma, remember her way of loving people and share some great recipes. Yay! This is such a neat idea! I have a treasure trove of recipes myself from Peter’s mother, Jill, who died when he was just 7 years old. I love the idea of reconnecting (or in my case, connecting for the first time) through food. What a time-honored tradition! I’ll be following your blog for sure. 🙂 I don’t blog on WordPress but have a profile so I can creep and comment on WP blogs. My usual writing spot (sporadic though it may be) is http://www.thejinglejangle.blogspot.com. Thanks Erin! I’m glad you enjoyed your visit! Feel free to “creep” anytime and share our blog with your blogger friends! Thanks for visiting! The cinnamon rolls are totally worth the time. They are fabulous! Enjoy!